BEVERLY HILLS (Herald de Paris) — From the barrio to Beverly Hills, this folk singing sensation took the world by storm beginning in the early 1960’s and continues the tempest even today. Trini elicits standing ovations everywhere he performs and his smooth style knows no age barrier. Exhibit Records has just released a Special 50th Anniversary Numbered Limited Edition album of Trini Lopez, “At PJ’s.” The 200-gram vinyl record is presented in a sturdy old style gatefold jacket featuring the original album art work and, for the first time, includes the lyrics to all the tunes. The back of each album is foil-stamped with its unique number. 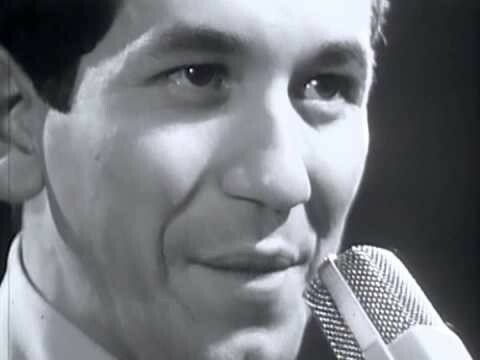 With the release of the PJ album in April 1963 Trini Lopez became one of the biggest singing stars of the Folk Revival. At PJ’s made it to #2 on the Billboard charts and stayed in the Top 40 for over a year. The album included the chart-topping If I Had a Hammer which reached number one in 36 countries and was a radio favorite for many years. The hit single sold more than 4 million copies; the album sold over a million and was awarded a gold record. This was the album that made Lopez an instant success and the live party atmosphere of the record did much to put Trini’s likable energy over the top. What Lopez did at the head of a trio was to make folk-pop swing. Other songs include This Land Is Your Land and Gotta Travel On. It could be surmised that by treating such material in this fashion, Lopez had a tiny influence upon the subsequent folk-rock movement…though, Lopez was more the all-around entertainer with a Latin lilt than he was a pure folk singer, so you also get America (from West Side Story), La Bamba, Ray Charles’ What’d I Say, Volare, and When the Saints Go Marching In. Trini learned to play the guitar from his father. Then he played for money on the street corners. He eventually went on to form his own group. It was then that the world saw the beginnings of the singing, acting, and very talented Trini Lopez. Trini’s first songs were Mexican sing-alongs with his mother, father, brother, and sisters. He dropped out of high school to help his father support the family by singing around Dallas and the Texas “Southland.” Trini’s quality could not be denied. He went on to the El Cipango Club in Dallas (a more affluent part of Dallas) and to other big clubs throughout the Southwest. He realized music would make him something special. Indeed it did, enabling him to get himself, and his family, out of the barrio. When he was 18 years old, King Records in Cincinnati, Ohio, heard that Trini had written and recorded a single in Dallas on a little label called Volk Records. The name of the song was The Right to Rock. From the beginning the record producer wanted Trini to change his name to anything but Lopez. Trini was, and is, proud of his heritage and was devastated by the situation. Trini refused and was heading out the door when the record producer stopped him and said, “Okay, okay, you can keep your name.” The single made a little noise in Dallas, enough noise for King Records to be impressed with Trini’s voice and style. King Records offered Trini a recording contract and for three years and flew Trini from Dallas to Cincinnati to record for two weeks at a time. Unfortunately, the only songs they were giving Trini to record were old country songs they had in their catalog by country artists such as Cowboy Copus. Once in a while in some recording sessions, Trini would slip in some of his own compositions that were more up to date. The only song to hit the charts nationally on the King label for Trini was a song Trini covered by the Skyliners called Since I Don’t Have You. The song hit the Top 10 nationwide, and Trini was elated to see his name on Cashbox, and Billboard. The only other song on King Records Trini had that was a No. 1 hit in his hometown of Dallas was a song called Don’t Let Your Sweet Love Die. Trini befriended the famous recording artist Buddy Holly, a fellow Texan. Buddy Holly asked if Trini would like to meet his record producer in Clovis, New Mexico. Trini was elated and packed his station wagon with his group and drove to Clovis with the hopes of recording. Buddy Holly’s record producer turned out to be prejudiced because of Trini’s heritage. He would not allow the use of Trini’s name on the record label. Trini’s group agreed with the conspiracy against Trini’s Latin name, and they agreed not to allow Trini to sing on the record. The record was released as an instrumental under the name “The Big Beats.” When Trini returned to Dallas, he disbanded the group and assembled a new band. While in Clovis, Trini befriended not only Buddy Holly but also his band, The Crickets. As fate would have it, two months later, Buddy Holly was killed in the fatal plane crash along with Richie Valens and The Big Bopper. A couple of months after the plane crash, Trini received a phone call from The Crickets asking him to come to Hollywood to be their lead singer. Trini was ecstatic and, instead of flying, he used the money sent by The Crickets to drive his station wagon to Los Angeles. All through the two and half day trip Trini kept saying to himself, “Hollywood or bust! Hollywood or bust!! !” In 1960, Trini arrived in H-O-L-L-Y-W-O-O-D driving his old station wagon with “Trini Lopez and his Combo” painted on each side. The agreement Trini had with The Crickets did not materialize because The Crickets were enjoying their royalties and record sales from Buddy Holly’s past hit recordings and were in no hurry to perform. Lopez left Dallas with $200 and it was soon gone. He had promised he would be sending monies to his parents from his engagements in California. Out of desperation, Trini Lopez, the soloist was born. Trini got a job at the Ye Little Club in Beverly Hills. He was hired with no group, just with his guitar. His engagement was to last two weeks and ended up lasting a year. The first big break came at the popular night spot called P. J.’s. Here he was spotted by the world famous record producer, the late Don Costa, who then brought Trini to the attention of his longtime idol, Frank Sinatra. The great singer recognized a fellow stylist and immediately signed Trini to an exclusive eight-year contract with his own label – Reprise Records. Reprise released his first album Trini Lopez at P. J.’s, which became a No. 1 hit album. Out of that album a single If I Had a Hammer became a No. 1 hit in thirty eight countries. If I Had a Hammer hammered his name in GOLD with many hit albums and many hit singles … and in the hearts of millions of fans throughout the world! Following Hammer were many hits which he wrote, as well as songs like I’m Coming Home Cindy, Michael, Lemon Tree, Kansas City, America, and, of course, La Bamba. The list of songs he made famous goes on. It wasn’t until If I Had A Hammer ultimately sold five million copies (and still selling throughout the world) that he got it through his head he IS something special. He began by playing a priest and a parole officer on two of Jack Webb’s Adam 12 TV shows for Universal, which was aired on the NBC network. From there he went to movies. Frank Sinatra cast Trini in his first appearance: the movie, Marriage on the Rocks, which also starring Frank Sinatra and Dean Martin. His second movie appearance was in A Poppy is Also a Flower starring Sean Connery, Marcello Mastroianni and a star-studded cast. Following this was the classic The Dirty Dozen starring Lee Marvin and Charles Bronson and another star studded cast. Trini’s first starring role was in Antonio with his co-star, the infamous “J.R.,” Larry Hagman. Then he became an army G.I. for a TV Movie of the Week called The Reluctant Heroes for Aaron Spelling Productions. The future for Trini will be as active as usual with touring around the world, a new album in the making, and hopefully a movie, but now he is more selective and chooses his projects carefully. Since his move to Palm Springs, where he now resides year-round, the “laid-back” atmosphere has sort of rubbed-off on him, and it’s not necessary for Trini to do every project he’s offered. So, you’ll find him on the tennis courts or golf course almost any day, as it has become a new passion with him. And he has the trophies to prove it. Herald de Paris, Consulting Editor Dr. Al Carlos Hernandez was honored to speak with the music legend. AC: Tell us about growing up poor in Dallas. Was your first language Spanish? Tell us a little about your family. TL: Growing up in Dallas was very difficult for me. My family and I lived in a two room house and it certainly was crowded. My first language was Spanish. My father and mother were very poor, but they were very rich spiritually. AC: What kind of music did you listen to around the house? Your dad was musically talented? TL: I listened to Spanish music around my house growing up – my father taught me my first Spanish songs at a very young age. AC: Did growing up poor color your musical choices later in life by pursuing folk music which was known for its commentary on social change? TL: Later on in my life, folk music influenced my very much because folk music, at that time, had a very interesting message. Being poor had nothing to do with it. AC: What gave you the courage to take your music to Dallas’ more affluent clubs? Did you consciously want to cross over and play to English speaking audiences? TL: I started singing English songs to Anglo people from the beginning of my career. The more affluent clubs in Dallas approached me because of my reputation as an entertainer at that time. AC: How did Latinos in your community react to the idea of you doing songs in English? TL: My Latin friends enjoyed hearing me sing rock and roll and popular songs. AC: What did the Anglo audiences think of you at first and did you have to win them over? TL: I was always very lucky, whether the audience was Latino or Anglo, they always enjoyed my singing. AC: Tell us about landing your first record deal at 18? TL: I was contacted by phone by King Records in Cincinnati, Ohio. King Records heard the first record I recorded for a small label in Dallas. The song was The Right to Rock. AC: The Right to Rock? TL: When I wrote the song The Right to Rock, I was singing mostly rock and roll. AC: What kind of a performer did you want to be? An Elvis, a Chuck Berry, a folk singer? TL: I just wanted to be a popular singer. AC: Why did you fight so hard to keep your name when the producer wanted to change it? TL: I was, and am, very proud to be a Mexicano! AC: Do you think changing your name to an Anglo one could have helped your career? AC: You were one of the first Latino megastars who kept their Latino name. That took a lot of guts back then. Does the Latino community appreciate this? AC: Tell us about the early recordings. How did you feel hearing yourself on the radio? How did your family react to your initial success? TL: The first time I heard myself on the radio I was driving along in my station wagon and I pulled over to the side of the street. I listened to the whole song and waited until the disc jockey mentioned my name. I was very excited, of course. AC: Tell us about some of the first songs you had written. Was it harder for a Latino to break into mainstream music at that time? TL: It was very, very difficult!!! The songs I wrote in my early career were The Right to Rock, Rock On and Only In My Dreams. AC: How did you meet Buddy Holly and what was that friendship like? He asked me if I would you like to meet his record producer. That was how I met Buddy Holly. AC: You mentioned that when Buddy passed away, The Crickets called you to come to Hollywood to replace him. TL: Yes, when Buddy was killed his group, The Crickets, asked me to come and join them in Hollywood, then go on tour with them as their lead singer. AC: Tell us about becoming a totally broke solo artist in LA. Your objective was to send home money to your family, correct? TL: My objective when I first went to Los Angeles was to get a singing engagement as soon as possible because I told my parents I would send them money as quickly as I could. AC: At that time, who was big in performing and getting good gigs? Who were your contemporaries? TL: At the time I went to Hollywood in 1960, the people who were getting the good gigs were Frank Sinatra, Perry Como, Dean Martin, and Sammy Davis Jr., etc. My contemporaries were The Everly Brothers, Eddie Cochran, and actor/singer Tommy Sands. AC: Tell us about PJ’s and meeting Don Costa. What was his impact on your career? TL: Meeting Don Costa at PJ’s had one of the biggest impacts on my career. Don Costa, at that time, was producing and recording artists like Frank Sinatra and Barbra Streisand. AC: Because of Costa, you started hanging with people like Sinatra and many other mega stars. How did they treat you? TL: Because of Don Costa, I had hits on my first two albums recorded live at PJ’s. Right after that, Frank Sinatra wanted to meet me and he introduced me to artists like Dean Martin, Sammy Davis Jr., and many more big stars. All these mega stars treated me with a lot of respect and admiration. AC: How did you assemble songs for this legendary PJ’s album? AC: Did you want to be a folk singer? Have you been type-cast as a folk singer? TL: They wanted to type cast me as a folk singer because at that time folk music was very popular. AC: How did your life change when the album became a monster hit and If I had a Hammer sold five million copies? TL: Having a hit single and album did not affect me at all. I always have had my feet on the ground. AC: Did the fame and fortune cause you to go into excesses, like so many artists have over the years? TL: The only excessive thing I started to do was I spent a lot of money on clothes! AC: How do you like being a music icon? What is the good and bad of fame for you? TL: I have enjoyed it all my life. There is no good or bad, it is what you make it. AC: Tell us about your acting career. How did this all get started? TL: When I started my career, I was approached by the producer of The Dirty Dozen and he said that he would like for me to play the part of Jimenez in the movie. That’s how it all started. AC: Tell us about The Dirty Dozen – that was an iconic film. What was that like? TL: It was very exciting to be a part of such a marvelous cast. AC: What are some of the highlights of your acting reel? Did you ever consider becoming a full time film and TV actor? TL: Working and doing a little bit of acting with actors like John Cassavetes and Lee Marvin were some of the highlights. I wanted to do more acting in my career, but it is a very difficult act to get into. AC: You have never been overtly political but rather you let your music make your statement about things. Have you shied away from political causes considering you are one of the highest profile Mexican-American performers in American History? TL: I have purposely shied away from politics. AC: Is there a reason you have kept a low profile on these sorts of things? TL: Yes, the reason is I think an entertainer/artist should keep to his own business. AC: You are involved in many things including a signature series of guitars. Can you tell us about some of your side interests and hobbies? TL: My only other interest other than my Gibson guitars is I enjoy golf and tennis. AC: You have continued to travel and tour the world over the years and still keep your music fresh. What motivates you to keep it going? TL: That is a hard question. It is my inner self and spirit that makes me want to make people happy. AC: Tell us all about the Special 50th Anniversary Numbered Limited Edition album of Trini Lopez At PJ’s? TL: My most successful album in my career has always been Trini Lopez Live in P.J’s. I am thrilled Exhibit Records is re-issuing my very first LP in vinyl!!! AC: Are you planning to tour in support of the re-release? TL: If I get the right offers, I will. AC: What can fans expect from the LP? TL: Beside all of the lyrics being printed on the inside jacket, the recording itself is digitally re-mastered. AC: How do you think history will remember you? TL: I hope history will remember me as a down-to-earth person who loves people. TL: I would like to do some serious acting. TL: It’s nice to be important, but it’s more important to be nice.